Posted on Sat, Mar 10, 2012 : 5 a.m.
Yogi Berra, the famous New York Yankees catcher and wit, said, "You better cut the pizza in four pieces because I'm not hungry enough to eat six." 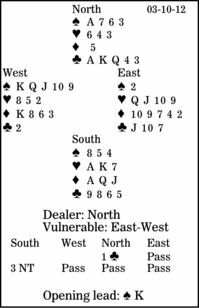 In this deal, how would you play in three no-trump after West leads the spade king? Your response of three no-trump showed a balanced hand with 13 to 15 points. (Two no-trump would have been game-invitational with only 10 to 12 points.) It was a debatable choice with no spade stopper, but nothing else looked better. You have seven top tricks: one spade, two hearts, one diamond and three clubs. And it looks easy because as long as clubs are not 4-0, you can get two more tricks there. However, look closely at the club spot-cards. If the clubs are 3-1 (which is more likely than 2-2), after cashing dummy's three winners, you will have to take the fourth round in your hand, and there will be no dummy entry left, given that West will continue spades to get that ace off the board. You can make the contract by running four club tricks, guessing that West has the diamond king and working out his distribution. But it is much better to duck the first trick and to duck again when West continues spades. You take the third spade with dummy's ace, then cash the club ace and king, confirming the 3-1 split. Now play dummy's last spade and discard a club from your hand to unblock the suit. After that, it is plain sailing. Do you lose a spade trick? Yes, yes, no, yes, yes -- but you make your contract.